Posted November 6, 2018 by Seán Kinane & filed under Elections, News and Public Affairs. 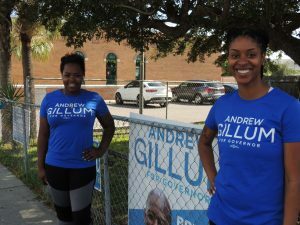 Meanwhile, in Tallahassee, his Democratic opponent, Mayor Andrew Gillum voted with his family. And after a bruising and bitter U.S. Senate campaign, Florida voters are now choosing whether to keep three-term incumbent Democrat Bill Nelson in office or replace him with Republican Governor Rick Scott. The choice could determine Republican control of the Senate. The Orlando Sentinel is reporting that in Palm Bay on the East Coast, a voting precinct was closed after a gunman arrived. Ashley Suttle Dalrymple (l) owns a restaurant in Tampa. She closed it so employees like Lakingya Williams (r) could vote on Election Day 2018. By Seán Kinane / WMNF News. The West Tampa Library was used as a county-wide early voting location in Hillsborough. But on Tuesday only people in that precinct can vote there. That may explain why poll watchers indicated that dozens of voters had been turned away and given the addresses of their correct precincts. At the West Tampa Library, a restaurant owner, Ashley Suttle Dalrymple, had just closed her shop so her employees could vote. Lakingya Williams is one of the restaurant employees and got to vote. Civil rights activist and former presidential candidate Rev. Jesse Jackson talked about the election Tuesday on WMNF’s Radioactivity. Host Rob Lorei asked Rev. Jackson what’s at stake on the historic day. When WMNF spoke with voters Tuesday, some were happy to talk about their favorite candidates. But some, like Thomas Terry is from West Tampa, were more interested in talking about the issues important to them. In Terry’s case, it’s Amendment 4, to restore voting rights to most ex-felons. As of 2:20 p.m. Tuesday , more than 56% of registered voters had cast a ballot in Pinellas County, most of them voting by mail. In Hillsborough, turnout was more than 52 percent with Election Day voting accounting for less than a quarter of votes so far. In New Port Richey a church that is also used as a voting location posted a photo on its Facebook page of a sign there, outside the 100-foot limit for political campaign ads. 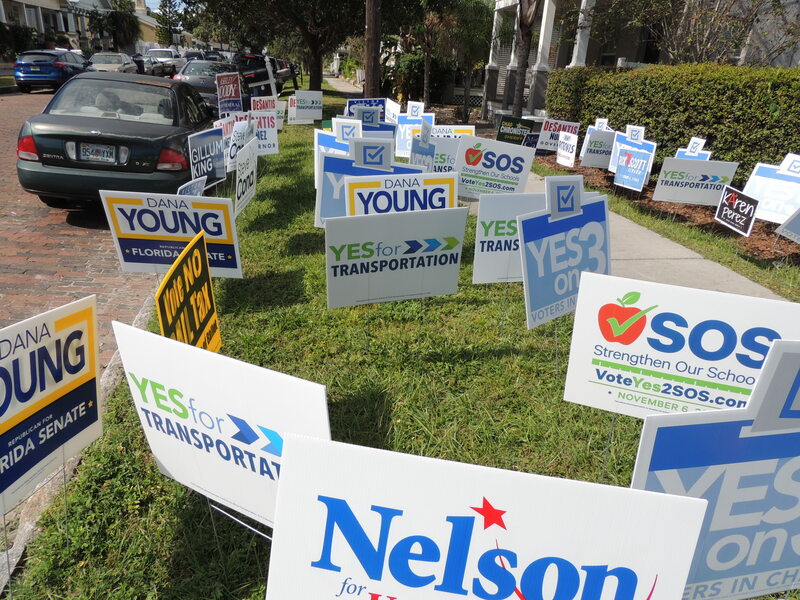 The sign reads, “Don’t vote for Democrats on Tuesday and sing ‘Oh how I love Jesus’ on Sunday.” The Pasco County Supervisor of Elections, Brian Corley, told the Tampa Bay Times that he politely asked the pastor to remove the sign, but the pastor refused. Corley said, “We will not use the facility again,” as long as it has the same pastor. Elsewhere in the country, long lines and malfunctioning machines marred the first hours of voting in some precincts. Some of the biggest problems today were in Georgia, a state with a hotly contested gubernatorial election. Voters reported waiting up to three hours to vote. Reports of broken ballot scanners are leading to long lines at several polling sites across New York City. Turnout was so heavy this morning at one packed precinct on Manhattan’s Upper West Side that the line to scan ballots stretched around a junior high school gym.